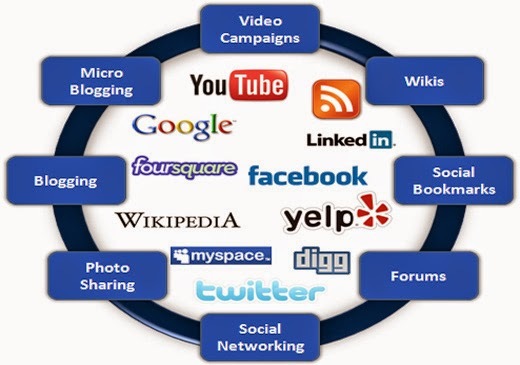 social media optimization tutorial tips how to effectively use social media for marketing facebook google plus twitter. Book mark your website at a time above 50 bookmarking websites like reddit.com digg, delicious dingo and other etc. This free service build 25 bookmarks or back links every for 30 days for one website. This service helped create a network wheel when your posting on your blog it automatically publish to social media websites like face book twitter MySpace web2.0 websites like blogger.com wordpress.org and other may be more than 40 services. Other web2.0 websites like thumblr.com blogger webs live journal typepad. Auto posting to Google plus need to use premium services or wordpress plugins like network publisher. Google recently disabled Google api consolation so we need to post manually. But you are in blogger platform you can share automatically to your Google plus profile and Google plus page. Auto posting to twitter quite easy I am using for the past 3 years twitterfeed.com it can auto post face book page and profile, linked in profile and company page. Twitter backlinks to your website green signal in Google eye. Facebook promotion takes lot of advantages because lot of traffic coming from facebook only. YouTube is the better way get tons of traffic do you know what is second search engine after Google The answer is YouTube. you can see in Google results how a YouTube videos rank first among all the results so many bloggers are depending on only on YouTube traffic youtube only suite for a blog that can provide answers to the how to questions. Pinterest is the great platform to share your images and grab followers means gets traffic to your blog or website. just you need to place social icons on your website especially pin it button if someone like your image the pin you’re on their interest board..